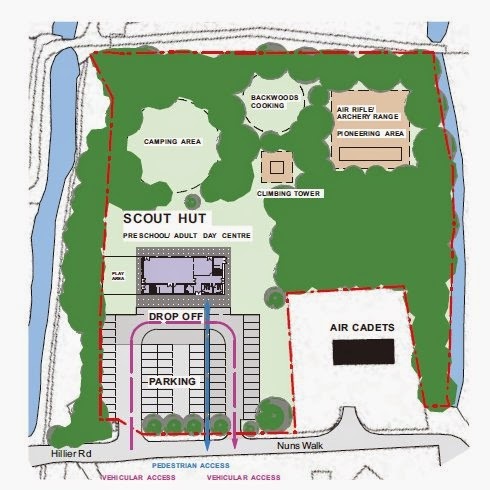 By now many of you have heard that the Winchester Scouts are proposing to build a new Scout hut on the wasteland next to the Air Cadets’ building. Yesterday most St Bede’s pupils should have come home with a leaflet that will eventually be distributed by the Scouts all around Abbotts Barton to ask for support for their scheme. Leave a comment in the comments section below. Send us a tweet or message via Twitter. Leave a comment on our Facebook page and or the Facebook forum. Use the form on our Contact page to send us a message. We meet regularly with the local Councillors and have also been invited to meet with the Council Officers to discuss your views. One of our aims is to find out about the process for deciding whether the lease will be approved and with what conditions. The Scouts’ leaflet and petition are only the start of the process. We are hopeful that this project will finally help the Abbotts Barton community to get access to a local building for community group meetings and other community driven activities. Some Scout buildings do rent out rooms and in this case the Scouts have offered that community groups can use the building when it is not used by the Scouts. The main issue is how much access the community will have, how frequently, and at what times. We will be talking to the Scouts and the Council about this in order to try and put the community needs at the heart of the process. If you wish to agree to the Scouts’ proposal we recommend that you also put on the form or the petition what community use you would like to see and you think could reasonably be requested. Please tell us what you wrote, so that we are in the best position to represent your views. We recognise that the area will need to be fenced off as this project will not happen without that, the fence is needed for safeguarding purposes. The Scouts couldn't use an area for camping that might have needles or dog fouling left around for example. In addition to that, many parents in Abbotts Barton weren't happy with the Council’s proposal to make this an open area (as a replacement for lost play space in the heart of Abbotts Barton) due to ongoing anti-social behaviour issues and not being able to oversee the area; having it properly fenced off will stop the anti-social behaviour issues. We hope you can take the time to read the leaflet, consider our views and leave us some feedback!